Making quiche at home is easier than you’d think! All you need is an oven and 7 ingredients to make this fluffy and savory Parmesan And Broccoli Quiche Recipe. Ready, set, bake! Sometimes I get bit by the brunch bug! Actually, these days it’s pretty common for a bit of brunch to sound like a great idea on Saturday and Sunday. You see, Ben and I are trying our best to work super hard writing blog posts and shooting recipe videos during the week – and then turning it completely off on the weekends. It’s a new schedule for us, and we’re loving it! And it was last Saturday that I asked Ben if he’d like me to whip up a parmesan cheese loaded broccoli quiche for a spot of brunch. But, if you know me, you know I love cooking. 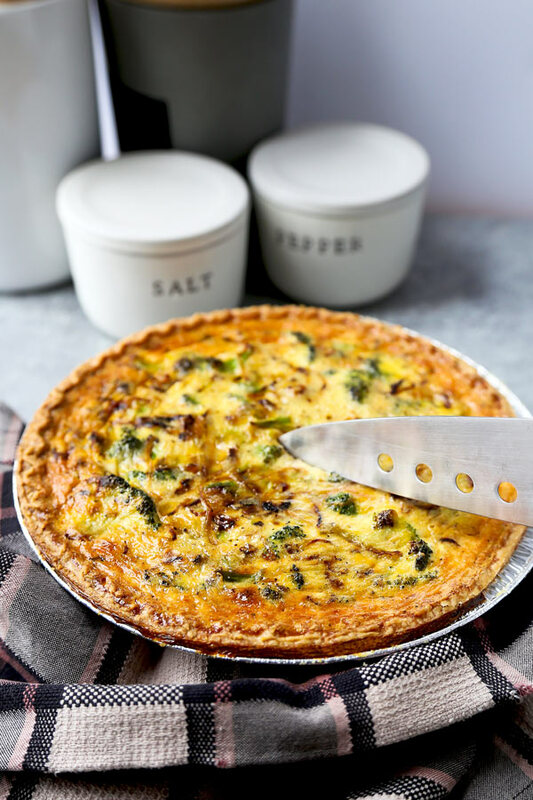 For me, spending an hour in the kitchen dreaming up a savory and healthy quiche recipe is about as relaxing and fun as anything has the right to be. So I made the heck out of that yummy broccoli and cheese quiche! And as we ate it in front of the TV during a full-blown Hulu marathon, I just knew that I’d be making this easy quiche recipe again for the blog. It was too delicious not to. Plus, the fact that this is one of the easiest eggy, cheesy broccoli recipes around gives me hope that you’ll try it for yourselves on a lazy Saturday morning. 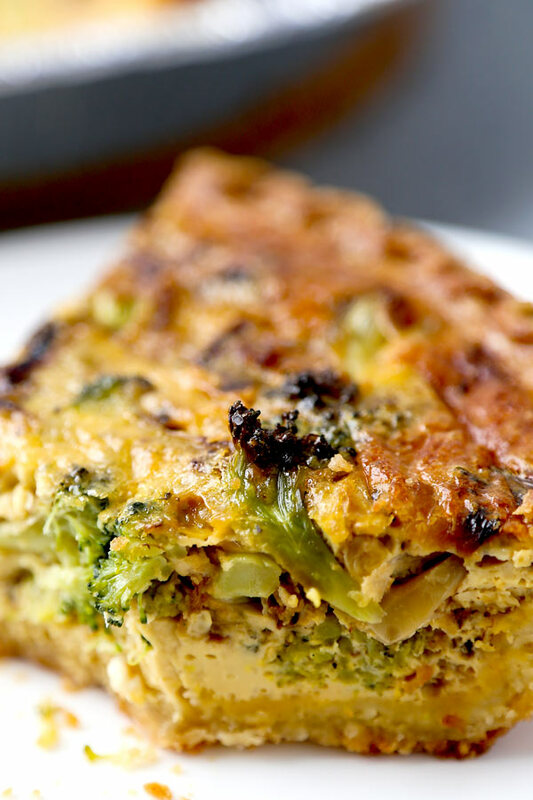 This healthy broccoli quiche has more than just amazing flavor going for it. It just happens to be so easy to make that you can’t really mess it up unless you really try to. Seriously, the only way you could really do any damage is to over-bake it. Buck up… You’ve got this! Don’t worry if you’re not super confident in the quiche making department – or with baking in general. This is one delicious yet basic quiche recipe that anyone can master. There’s no need to clear your schedule to make this parmesan and broccoli quiche at home. Sure, it’ll take just over an hour before you’re sinking your fork into this fluffy brunch classic – but the steps are so easy that it won’t even feel like work. Plus, cooking is fun! To start, you’re going to want to pre-bake your pie shell. Now, I’m using a premade shell for this broccoli quiche – and I put mine in the oven at 400°F for about 12 minutes. Be sure to read the instructions on your own brand of frozen pie shell. Instructions can vary from brand to brand. 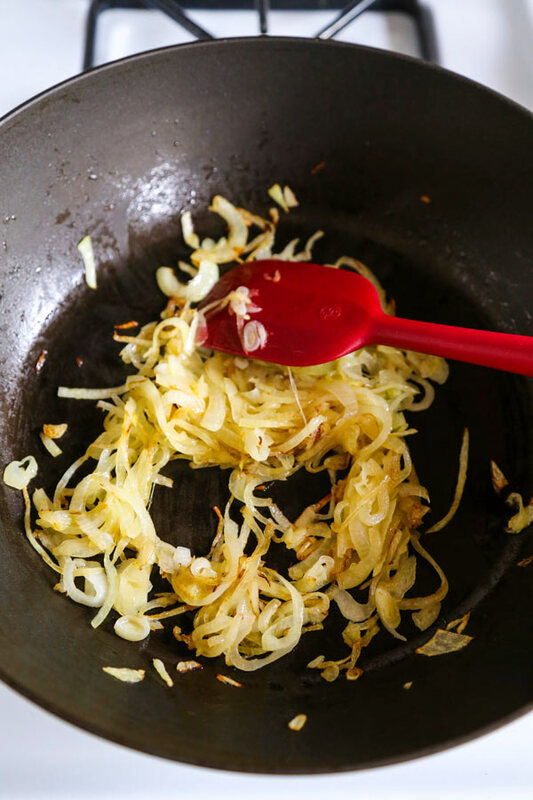 Then heat a couple tablespoons of extra virgin olive oil in a pan over medium heat and add one medium onion, thinly sliced into half moons. 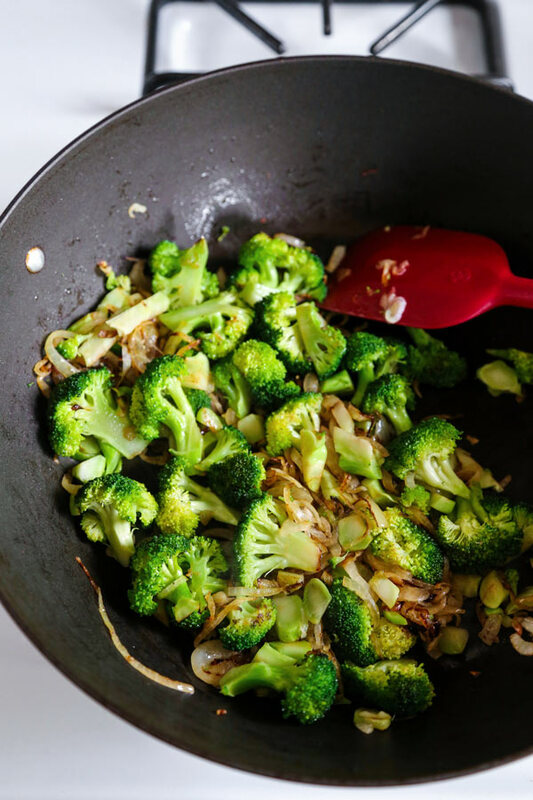 Cook that for about 7 minutes or so – then add your chopped broccoli and cook the mixture for an additional 9-10 minutes. Now – transfer the onions and broccoli to a plate and allow to cool to room temperature. Meanwhile, grab a large mixing bowl and whisk 6 large eggs with a cup of 2% milk. Then stir in ½ cup of freshly grated parmesan cheese and your cooled onions and broccoli mixture. Hit it with a little kosher salt and freshly cracked black pepper, pour the mixture into your 9” pie shell and bake in the oven at 325°F for 35-40 minutes until fully cooked. At the point you find yourself wondering if it’s cooked through, just grab a toothpick and insert it in the center of your quiche. If it comes out clean, you’re good to go! Now, if you see a bit of wet eggy mixture, keep baking for a few minutes and repeat the toothpick test. What vegetables can you put in quiche? Short answer: pretty much anything you want. I went with finely chopped broccoli, slivered onions and freshly grated parmesan cheese for this yummy breakfast quiche. There’s a garden fresh pop from the broccoli, a sweetness from the onions and an earthy, savory undertone from the parmesan that I think just works from an elementary flavor combination perspective. However, you could totally make a spinach quiche if that’s more your thing. Other veggies that come to mind are green peas, red bell peppers, chopped zucchini, sun-dried tomatoes… The list could go on and on, but you get the idea. Pretty much any vegetables you like eating make solid candidates for your ingredients list. Or add lardons and make a quiche lorraine. 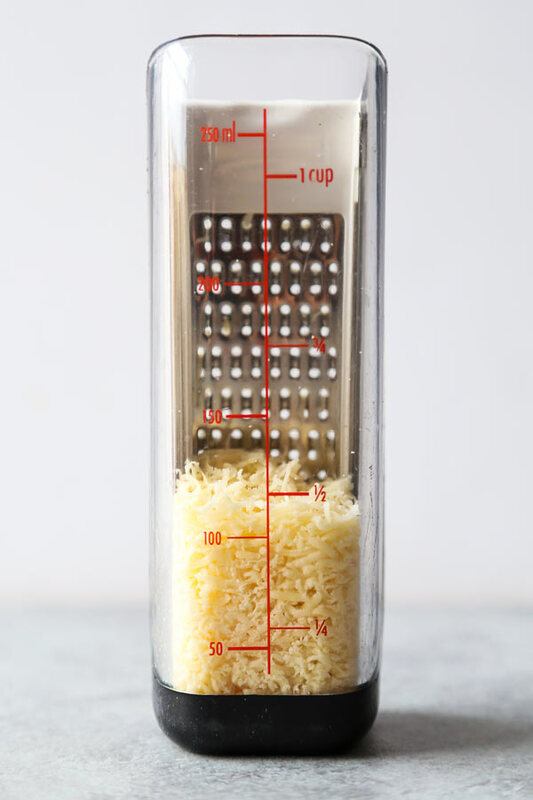 Not a fan of parmesan? No problem. Grab a nice sharp cheddar – and make a broccoli cheddar quiche instead. Taking it easy on carbs, or following a gluten free diet? Then make crustless quiche. Check out my crustless quiche with edamame and sundried tomatoes recipe here. By now you’re probably catching my drift… Quiche can contain whatever you like best. And, as long as you’re a fan of cheesy, eggy pies – it can act as a bit of a blank slate for your culinary whims. Therefore, the best quiche recipe is going to be the one filled with all your favorite ingredients! Can you make a quiche ahead of time? You can! Even though things like a plate of scrambled eggs don’t fare very well in the fridge, quiche is good for a couple of days in the refrigerator as long as it’s properly wrapped in plastic wrap or foil. So, if you’ve got a group of friends coming over on Sunday afternoon for a bite of food and a few mimosas, you could totally make it the day before and store it in the fridge. To reheat, simply microwave piece-by-piece until hot. Or reheat your parmesan and broccoli quiche as a whole in the oven at 325°F for 15 or so minutes. 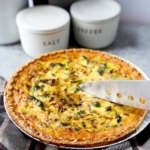 Although French in origin, quiche is of those recipes that belong to many cultures in its varied forms. You see, while the combination of eggs, cheese and milk baked in crust is decidedly French – the decision to use healthy broccoli sounds way more northern Californian than Parisian. In fact, I’d almost argue that quiche has achieved some of the same level of international recognition as the sandwich. Because whether you’re eating bánh mì in Hanoi or a panini in Milan, you’re still eating a sandwich. So go wild with your own quiche creations, and make them your own! 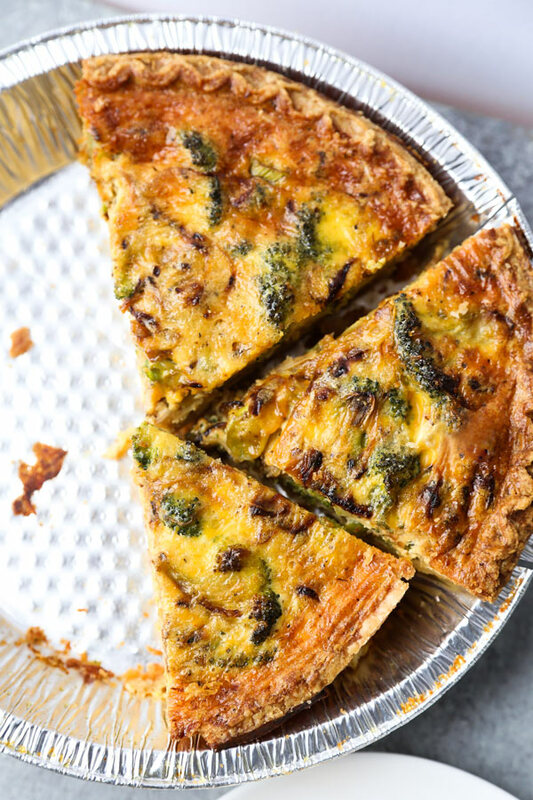 Whether you stick with this parmesan, onion and broccoli quiche recipe as it’s written, or go out on your own as an intrepid international food explorer, at the end of the day you’ll be chomping down on a delicious forkful of quiche. What about you? What’s your favorite brunch recipe to make on a lazy Saturday at home? I’d love to hear about your brunch creations in the comments section. 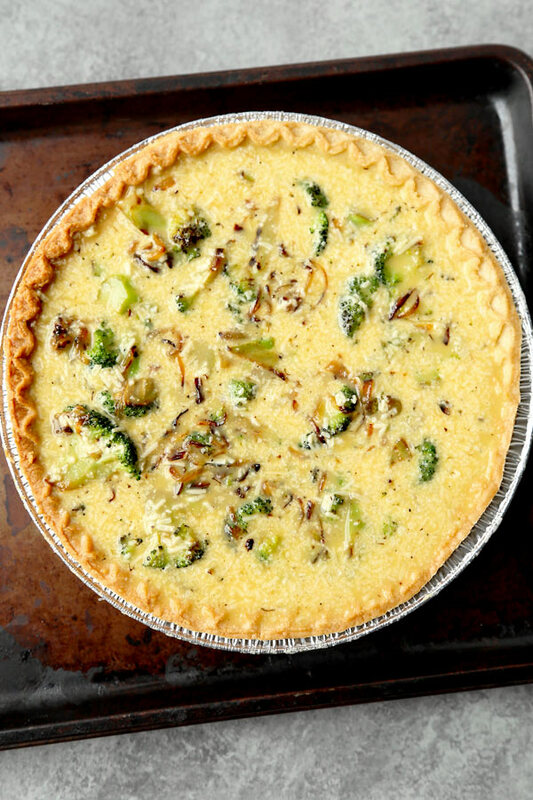 Did you like this Parmesan and Broccoli Quiche Recipe? Are there changes you made that you would like to share? Share your tips and recommendations in the comments section below! A savory and fluffy quiche recipe, loaded with parmesan and broccoli. Easy to make at home! Cook the pie shell for around 11-14 minutes until slightly golden (or follow instructions on the package for the specific brand of pie shell you have purchased). Take pie shell out of the oven and let cool to room temperature. Lower the temperature of the oven to 325°F. In a medium sized pan over medium heat, add olive oil and onions and cook for about 7 minutes. Add broccoli and cook for an additional 9-10 minutes, or until broccoli is tender. Transfer to a plate and let cool to room temperature. Bake in the oven for 35-40 minutes (or more, if needed). Stick a toothpick in the middle of the quiche. If it comes out clean, the quiche is ready to eat. Otherwise continue to bake until fully cooked. 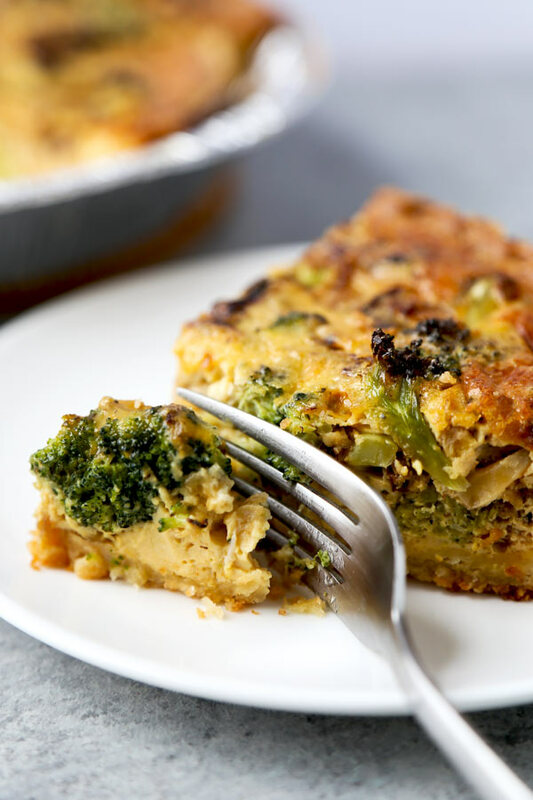 This parmesan and broccoli quiche tastes best fresh out of the oven – but will keep in the fridge for 2 days or so, provided it is well wrapped with plastic wrap or foil.